You have to like the ambition of this project. 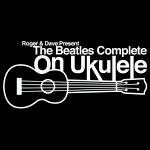 Roger Greenawalt and David Barratt started recording all 185 original Beatles compositions on the ukulele. They're making a new song available every week until July 31, 2012, the eve of the London Olympics. And, in each instance, they're working with different accompanying artists. As you'll see, the styles and approaches can vary widely, and the ukulele sounds can be more or less pronounced. Just compare Blackbird and She Said She Said (two of my Beatle faves) and you will see what I mean. To download the tracks, visit Roger and Dave's web site, or load this feed to iTunes or your RSS reader.